Tanya Doody and Jackson 2Bears performed Thursday October 5, 2017 at VIVO Media Arts. Crunching, slow and convulsing, the earth bears a weight. He sifted topsoil on the drum and she yelled out like a siren beckoning. Tanya Doody and Jackson 2Bears performance. Photo by Rennie Brown. Tanya Doody and Jackson 2Bears performance. Photo by Ash Tanasiychuk. 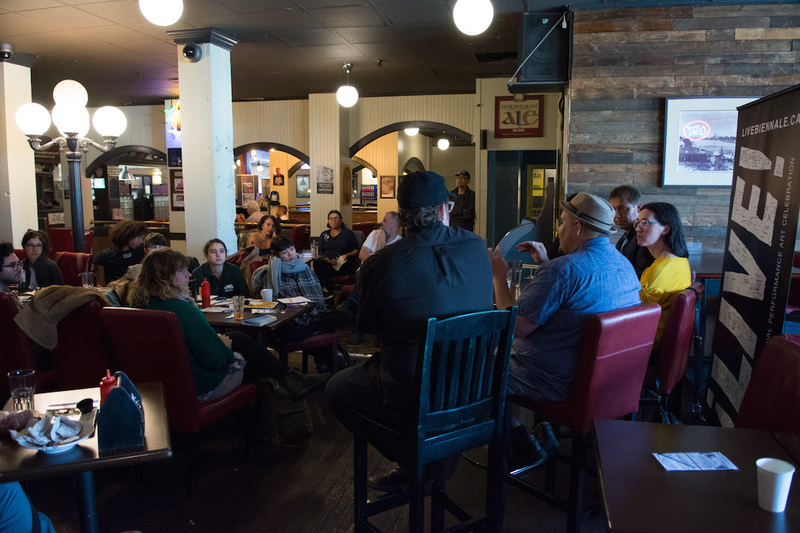 Tanya Doody and Jackson 2Bears participated in an artist talk with Louise Liliefeldt and Stein Henningsen at Pat’s Pub on Wednesday October 4, 2017. Tanya Doody and Jackson 2Bears artist talk. Photo by Ash Tanasiychuk. 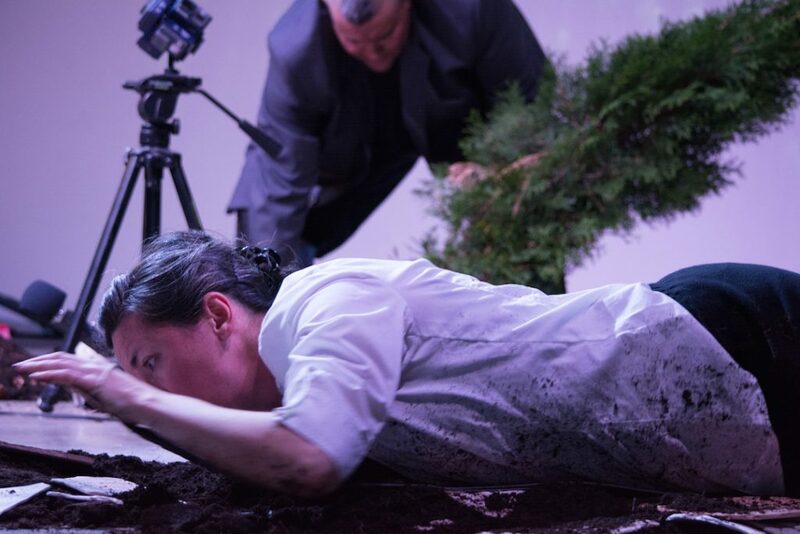 Evanescing This Harrowed Strata is a new collaborative multimedia performance piece by multidisciplinary artist Tanya Doody and Kanien’kehaka (Mohawk) multimedia artist Jackson 2Bears. 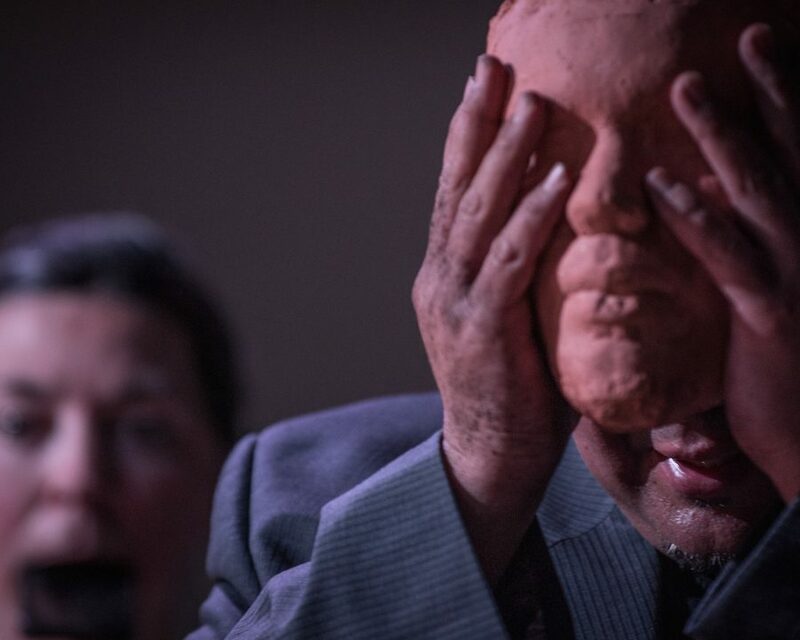 With the artwork we want to talk about stories written on the land, and the conflicted histories layered on the earth in this territory; we endeavour to immerse ourselves in troubled narratives, and we want to explore strange and complicated encounters and perform alternative vocalizations. 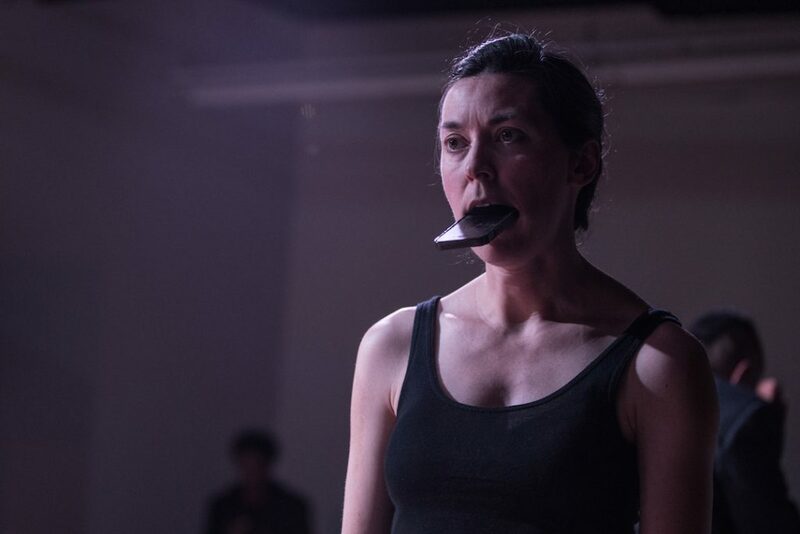 In this performance we work with multiple projections and use live and pre-recorded sound; we use a bed of clay ‘strata’ and contact microphones; we use a digitally-enabled hand-drum and ceramic objects with guitar effect pedals. 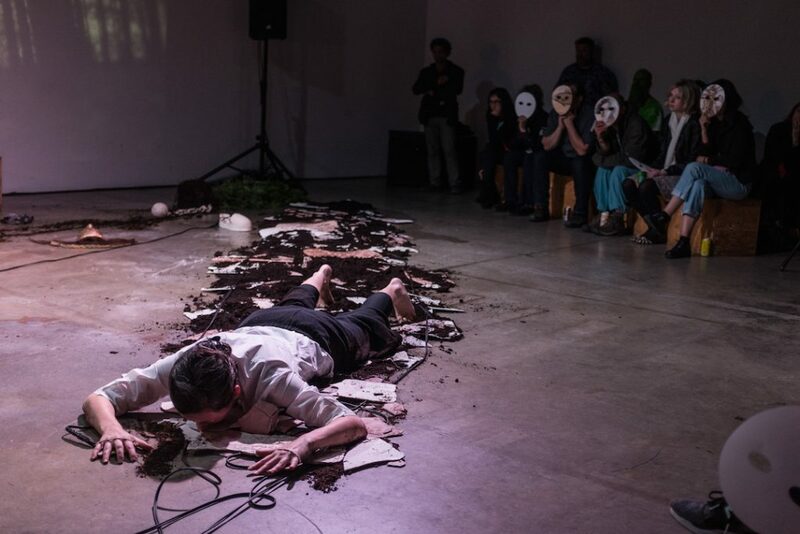 A small tree tied to a ceramic ball and chain is present, as is a ceramic mask, a ceramic shoe, and lots of soil — all of which are activated with gesture and sound. Jackson 2Bears and Tanya Doody have worked together on numerous projects under the auspices of Fort9 and divised the artist collective LiminaL projects (with co-creators Susanna Hood, Tom Kuo, and Dan Lavoie) to explore transdisciplinary ideas of collaboration combining movement, live performance, fashion, sculpture, turntablism and digital sound. 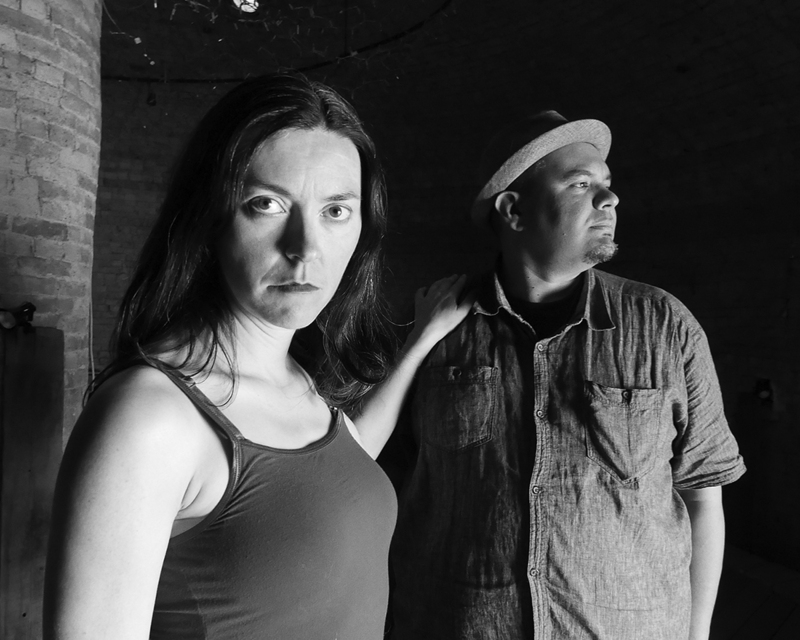 Evanescing This Harrowed Strata marks a return to working collaboratively for 2Bears and Doody, bound together in a process that incorporates individual practices while extending beyond the familiar. 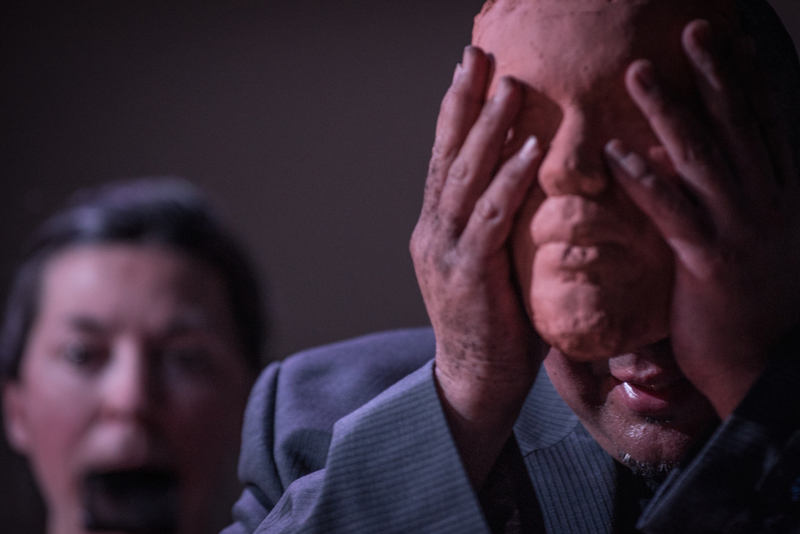 Tanya Doody is a multidisciplinary artist working at the intersection of ceramics and performance. Her work revolves around craftivist strategies, performative acts, and poetic gestures as she works within cultural contexts to explore traditional craft media beyond its historical roots. She has exhibited work across the continent in galleries and festivals, most recently at the Southern Alberta Art Gallery and in Calgary as part of the festival WILD: Fabricating a Frontier. 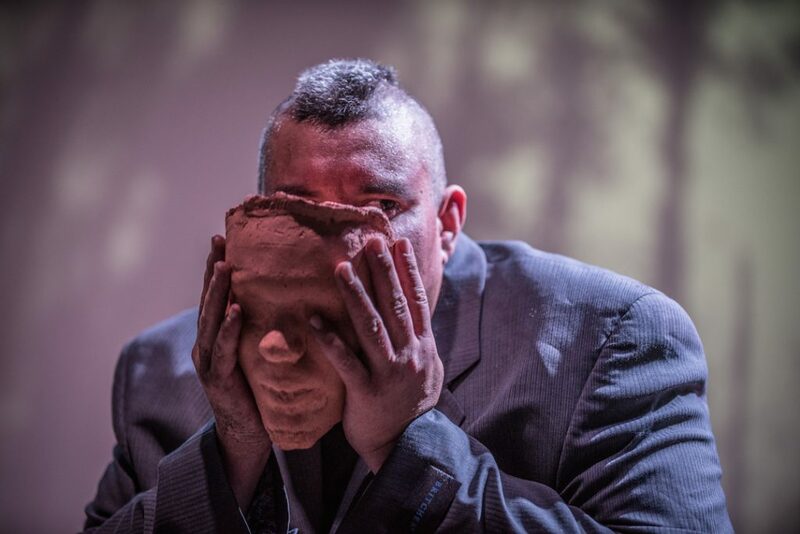 Jackson 2Bears is a Kanien’kehaka (Mohawk) multimedia installation/ performance artist and cultural theorist from Six Nations who is currently based in Lethbridge, Alberta/Treaty 7 Blackfoot Territory. Since 1999, 2Bears has exhibited his work extensively across Canada in public galleries, museums and artist-run centres, as well as internationally in festivals and exhibitions.